The Movie Directed by Ritesh Batra,The Director Behind stories like “Lunchbox”& “The Sense of ending” adapted From the Novel”Sense Of Ending” by Julian Barnes. “Our Soul at Night” another unusual story of relationship of Two widowed neighbors who are both lonely and develop an unexpected relationship ,in a small town in United States. The film stars Jane Fonda, playing the characters of Addie and Robert Redford playing the characters of Louis water as the lead. OurSouls at night Is too adapted from a novel written by Kent Haruf by the same name “OurSoulAtNight”. The Movie seemed “To Good To be True”as its a very happy film.Unlike the novel that has moments of drama over dramatised. The opening scene,straight away begins the story of , the two neighbours meeting and the story unfolds,immediately. The story targets the relation amongst the senior citizen age that hasn’t been showcased much,And Is done in a very light, enjoyable way. The movie Produced By NETFLIX, And premiered by JioMAMIFILMFEST with the Director Ritesh Batra,Part of Q&A Post screening was the highlight for movie buffs like me. 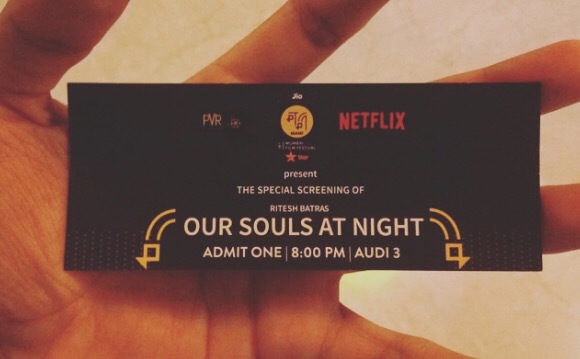 Our Souls @ Night is certainly, A Story you wouldn’t like to miss and from A director like Ritesh Batra…with whom You are always Surprised.